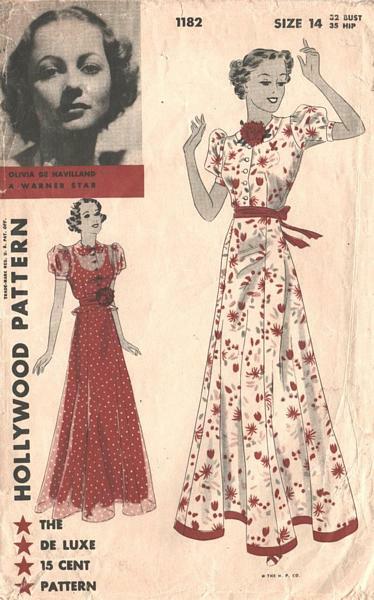 Vintage Hollywood sewing pattern 1182 featuring Warner Star actress Olivia De Havilland. Evening frock with or without tiny flared peplum. Six gored flared skirt joins bodice under belt. Blouse buttons down front below Peter Pan collar. Short puffed sleeves. Applied facing at lower edge of skirt is optional. Click on additional image below. Suggested Fabrics - organdy, dotted swiss, eyelet batiste, chiffon, cotton voile, organza, cotton lace, linen, chintz, heavy sheer, taffeta. Pattern is used and complete. Unprinted pattern pieces precut to size. Envelope is aged and has storage/use wrinkling but is solid. Undated, early to mid 1930's. Note: The featured photo shows the dress in sheer fabric, worn over a solid red slip. There is no mention or provision in the pattern for making the slip.